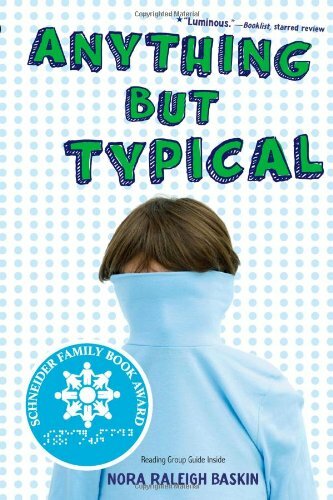 Anything But Typical was the title that caught my attention and pulled me into the mind of Jason Blake, an autistic 12 year old. Nora Raleigh Baskin, the author of Anything But Typical, has created a world in which this neurotypical boy lives in nightmare. “I am like a leaf on a river, riding along the top of the water, not quite floating, not quite drowning. So I can’t stop, and I can’t control the direction I am going. I can feel the water, but I can never know which way I am heading,” page 16. But when Jason is being picked on, or worried about what to do next, he always ends up finding his happy place, either sharing his creative stories with the world on his Storyboard website, or curling up in the arms of his parents. The only three caring friends Jason has are Aaron Miller, a friendly guy who always stands up for him, Jason’s younger brother Jeremy, an energetic boy who understands when Jason needs his time, and an online friend from Storyboard named Phoenixbird, who is Jason’s online “girlfriend” that he shares his stories with. But, Jason is afraid that if he meets Phoenixbird, she will only see the autistic side of him and not the side that really cares about his friends, family, and creative writing pieces. This first person narrative is an exciting and thrilling adventure of Jason Blake’s good and bad moments of life, and how he deals with the typical world around him. Nora Raleigh Baskin creates characters full of personality, excitement, and drama in this life changing tale of courage and friendship. The chapters always end with a cliffhanger about what is coming next, and left me thinking about what exciting moments are coming next. Whether it’s traveling to his uncle Bobby’s cabin, or boarding the plane to the Storyboard convention, I was hooked on every page of this creative tale of a brave and intelligent autistic boy. “We never really see ourselves the way other people do. I will just do the best I can,” page 188. If you like courage, friendship, and a little bit of sadness, this is the perfect book for you. Anything But Typical is a story you won’t want to ignore, and still, I am left with questions about what will come next for the boy who was afraid to take risks. You don’t know a person unless you’ve walked a mile in their shoes, and at the end of this story, you will know and feel the emotions of Jason Blake, the average autistic boy, with a creative mind bigger than you could ever imagine.